Cheryl Capistra's special education class at Nordstrom School of fourth through sixth graders recently took a field trip to Maurizio's restaurant in the downtown. Each student's task was to learn to ride a public bus, read the menu, order food, show good manners, pay for their meal and write a thank you letter. Their field trip was a culmination of vocational skills training. The students work in small groups or in one-on-one instruction to better meet their educational needs. Throughout the day, the students are also integrated into their grade level classrooms for optimal education. The students left Nordstrom School at 10:45 a.m. to take a public bus to Maurizio's Restaurant downtown. The class had a pass from the Valley Transportation Authority (VTA) which allowed them to ride the bus for free. After they arrived at the bus stop near the police station, the students walked across the street to the restaurant where they were greeted by Maurizio Cutrignelli, their gracious host. During the field trip, the children experienced a wide variety of flavors, a pleasant change from their everyday school lunches. Nancy Tobin, a fifth-grader, especially liked the fresh garlic, olive oil and balsamic vinegar, a concoction for dipping or spreading on bread. Spencer Muir, a fourth-grader, couldn't stop eating the macaroni and cheese, while Anthony Silacci, a sixth-grader, enjoyed everything. Anthony was able to try two different menu items, penne pasta with fresh tomato sauce and macaroni and cheese. Victoria Casteneda, a sixth-grader, wasn't satisfied with any of her options, so she asked the waiter, Maurizio, for something off the menu, two grilled chicken breasts. "It was fun, and the food was good. I learned good manners like 'Thank you' and 'Yes, please, '" said Justin Dover, a fifth-grade student. The kids loved the food so much that they were wearing it on their faces. There was no need for take-out boxes after this meal. The children paid for their meals using coins, so they could practice their knowledge of the value of quarters, nickels, dimes and pennies. Maurizio arranged for school-lunch style prices, which ranged from $1.52 for the penne pasta to $1.67 for the tortellini alfredo. 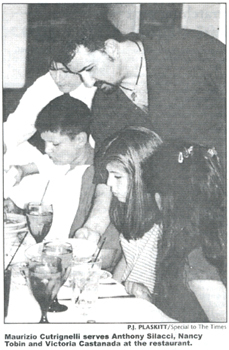 When the class returned to school, Anthony Siliacci asked if next time he came to the restaurant if those would still be the same prices. Even better, after the class left, Cutrignelli gave the money back to their teacher, saying the lunch was a gift. Also taking part in the field trip were students Claudia Castaneda, fifth grade, Laura Corona, sixth grade, Leah Giacalone, sixth grade, Suraya Townsend, fourth grade, Alex Nunes, fourth grade, and Blake Vanderhoof, sixth grade; instructional aides, Sara Torres and Cathy Podawiltz; resource specialist Sue Quick and sixth grade teacher Alicia Hamilton.